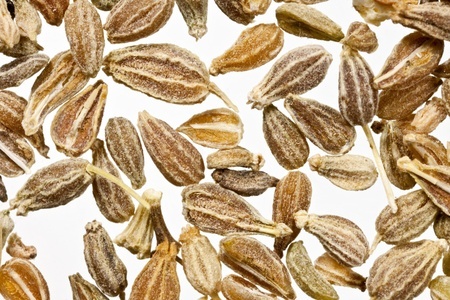 Ajwain, Trachyspermum ammi, also known as Ajowan caraway, bishop's weed or carom, is an annual herb in the family Apiaceae. The plant is mainly cultivated in Iran and India. Both the leaves and the fruit (often mistakenly called seeds) of the plant are consumed by humans. Ajwain is used as medicinal plant in traditional Ayurvedic medicine; primarily for stomach disorders such as indigestion, flatulence, and others but also for its supposed antispasmodic and carminative properties. Usually the crushed fruits are applied externally as a poultice. Hydrodistillation of Ajwain fruits yields an essential oil consisting primarily of thymol, gamma-terpinene and p-cymene as well as more than 20 trace compounds.